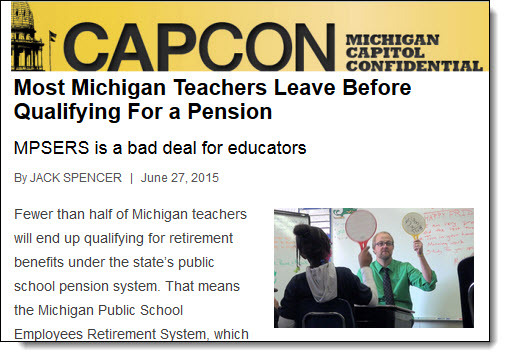 HomeOverspin From the Mackinac Center: Teachers Quitting Because They Don’t Like Pensions. 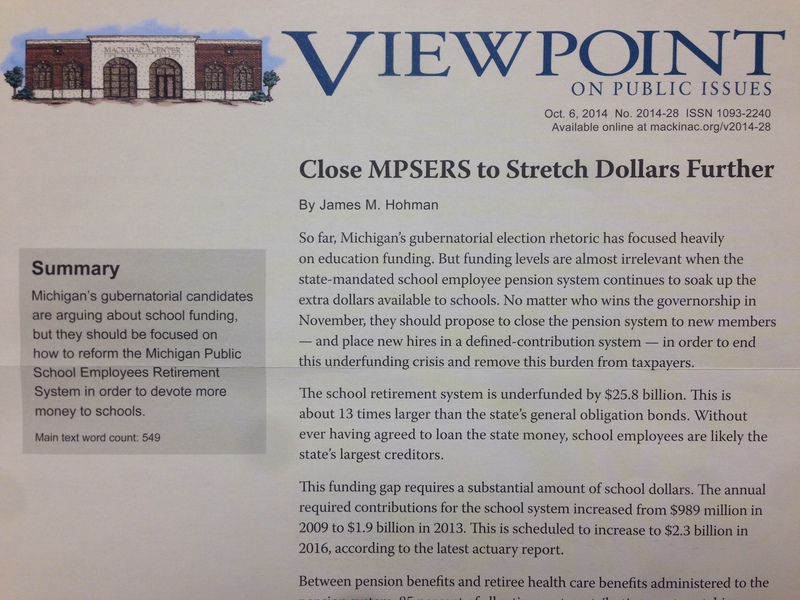 Overspin From the Mackinac Center: Teachers Quitting Because They Don’t Like Pensions. According to one estimate, just 43.4 percent of teachers will stay in the system for the 10 years required to become fully vested…That means the Michigan Public School Employees Retirement System, which carries a $26.5 billion unfunded liability, is not only a raw deal for taxpayers, it’s not a very good deal for most teachers either. Ignoring the fact that MPSERS is underfunded, because, well, the legislature underfunded it, and did it while the tanking economy cut the value of the system’s assets, concluding that teachers leave because the pension is “not a very good deal” is willful ignorance. Teachers and other school staffers are leaving because the right, led by the Mackinac Center itself, has spent years vilifying them while making it harder for them to pay their bills. Blinding itself to this reality, the Center’s Jack Spenser suggests teachers quit “to move, switch jobs, stay home with children or for another reason.” Only someone completely removed from the realities of working in Michigan public schools would submit that teachers leave their professions to stay home with the kids. You’d have to be funded by billionaires and corporations to think more than one or two school staffers in the state are in a position to do this. All of this is an entree for the Center to again recommend shutting down the state pension system, including MPSERS. States are shoring up the financial aspects of plans while making the benefits worse. State leaders must resist the temptation to fix only the most pressing financial problems, which risks making their state less attractive to current or future teachers. ← A Retiree Speaks Out: We Fought For Your Benefits. Don’t Throw Them Away With Your Membership!